Star Citizen: Are you looking forward to hopping on an alien space bike? Is $40 too much for what they’re offering? Wanna see more computer science lectures on ATV? We want your opinions for our feedback section, so stay tuned and we’ll tell you how to send them over. Elite Dangerous: What’s your take on Frontier’s response, or lack thereof? Do you think the request just got lost in the shuffle, or is it simply a case of it not being a problem until it’s public? Elite Dangerous: Will you be joining the fight against the Flower Power Spaceship Menace? Or are you high tailing it to Colonia before the swarm hits? Details for how to contact us with your battle plans will follow after Feedback. Star Citizen feedback: I currently have two Dragonflys, I may CCU one into the new Nox, depending on how I feel about it come the sale. Elite Dangerous feedback: I won’t be running nor fighting in the foreseeable future, I feel you guys hit it on the head with some of the issues with E:D. Their shiny things get me to come play but I never feel compelled to stay. I’m a fairly newish player (maybe 20-30 hours put into E:D), but I get no sense of direction while playing the game. The community has been super helpful to get me started, but without something in game other than ‘now i can buy a better weapon’ or ‘yay finally you can get a bigger ship’ I never stick around for very long. Some in game direction on what I should or could be doing would go a long way. Some direction on how to find these cool things everyone else sees without having to already know what it is I’m going looking for. Right now the only way for a new player to know to go find something, like the engineers, is if they already know they exist. I’ve not run into anything while playing the game that would put me on a path to the engineers, so had I not known that they were a thing and going and doing out of game research outside the game I’d have never known they were there, much less how to find or interact with them. I suppose this has gotten more to general feedback, but your conversation sparked my E:D keg this morning on the drive in to work I suppose. I’ll eventually play E:D some more, but hopefully at that point they have a bit more direction. Thanks for the show, keep up the good work. That”s not a Thargoid; It’s a Triffid! 1. I’m waiting to see what the new space bikes look like. 2. I’ll be joining the fight in Elite, sounds like fun. I do also see why the fight will be optional, because of the new player experience and explorers that have been out for months. Ruining months of work or someone’s first hour won’t do anyone any favors. 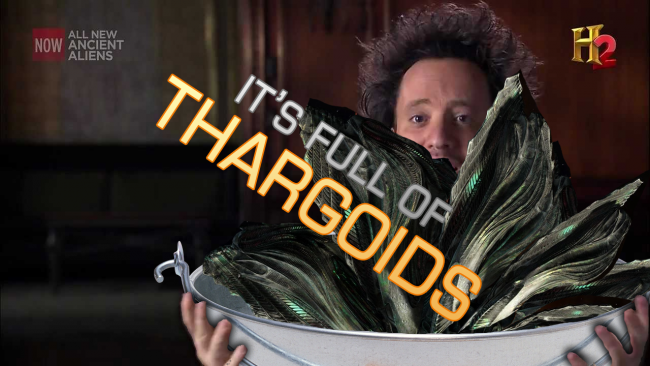 Also with some of the lore about the Thargoids that I’ve read about, it would make sense that they may not be interested in a full out invasion. That is if I read the stuff right or it’s even considered canon that the end a war a biological weapon was released against them, requiring the Alliance to help (resulting in the Alliance having a ‘Goid cap ship). As for how Elite is doing the patches, I think they are doing ok, just need to change some underlying mechanics to make things feel less like a grind and rely less on RNG on top of RNG, looking at you engineers with your secondary rolls. I do agree that once something is found and the data is turned in there should be way points and/or points of interest that can be purchased about that system. Wonderful show everyone.Personally i just havent looked at the space bikes enough to choose. I have a Dragonfly currently… I’m interested in seeing more about the NOX and I may melt the DF for the Nox but we’ll have to see. Guys, here’s a quick and dirty lesson in aircraft oxygen supplies. The Oxygen system used in legacy military fighter aircraft use liquid oxygen. Liquid oxygen has the advantage of only requiring a small amount of liquid carried compared to the amount of gas that it provides i.e. Liquid oxygen expands from 1 litre to 800+ gaseous oxygen for the pilot to breathe. The Oxygen needs to be replenished in a liquid form every so often. The OBOGS uses a molecular sieve that only allows the Oxygen molecules through and then concentrates them to a level that ensures that there is enough oxygen supplied to the pilot, regardless of altitude and outside pressure. This is better for many ways as you said. A big one is that there is no requirement to replenish the oxygen as you would in a legacy system. In both systems, gaseous oxygen bottles are used as a backup system just in case. Civilian aircraft don’t have oxygen supplied to the cabin unless there is an emergency (the yellow masks that drop from the cabins above). The cabin is pressurised to maintain ~7,000-8,000 ft. This is enough to maintain the oxygen concentration without any additional oxygen being supplied. The engines provide the pressurised air for cabin pressurisation.